Yelloweye that live in areas with a dark background often develop a dark brown-red back and sides with a red-orange belly. Brilliantly colored from orange-yellow to orange-red, yelloweye rockfish are one of the most well-known and prized of Alaska’s rockfish species. Deserving of their name, yelloweye are easily recognized by the bright yellow of their eyes. Individuals have been known to grow up to 36 inches which makes them one of the largest of rockfish species. A lighter colored line is usually distinguishable along the lateral line of the body and fins are often tipped in black. Yelloweye have several small spines on their head and a raspy ridge is found on the heads of large adults. Juveniles look very different from adults with dark red-orange coloration and two white stripes along the body. Fins of juveniles can be tipped in white or black. Yelloweye are often called red snapper, but should not be confused with the red snapper found in the Gulf of Mexico, which is a different species. Other names for yelloweye include Pacific red snapper, red rock cod, and yellow belly. Females produce a large number of eggs (up to 2,700,000) and give birth to live larval young. Larval release occurs between February and September. Larval yelloweye may be dispersed over a wide area as they drift with ocean currents. Their survival is affected by ocean conditions such as temperature, currents and the availability of food. Only a small percentage of larval yelloweye will survive to reach maturity. While in the larval stage, yelloweye feed on algae, other single-celled organisms, and small crustaceans. As they grow to adulthood, yelloweye shift to a variety of prey including other rockfish, sand lance, herring, flatfishes and crustaceans. Yelloweye are slow to mature but are very long lived. One individual was aged at 121 years old. In Southeast, Alaska yelloweye males mature around the age of 18 while females mature around 22 years old. When yelloweye larvae are born, they are carried with ocean currents and eventually settle onto the ocean floor where more protection from predators can be found. As juveniles mature they will move into deeper water habitat. 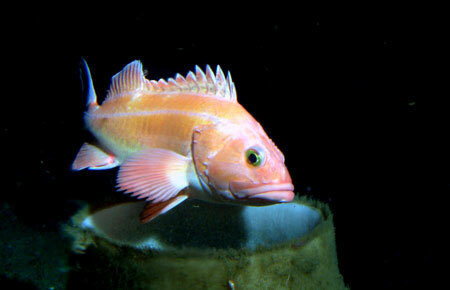 Adult yelloweye, like many species of non-pelagic rockfish, have small home ranges. Some may live their entire adult life on a single rock pile. Yelloweye are found along the western coast of North America from the Aleutian Islands to the Baja Peninsula. Adults are often solitary and inhabit steep rocky areas with nooks and crannies that they can seek shelter in. Usually found near the bottom, yelloweye rarely venture far from shelter. They are most commonly found between 300 ft and 600 ft but have been found in water as shallow as 48 ft and as deep as 1,800 ft.
Non-pelagic rockfish, including yelloweye, are extremely vulnerable to overfishing. While yelloweye rockfish stocks are considered healthy in Alaskan waters, careful management will be needed to protect the sustainability of yelloweye for the future. Yelloweye rockfish on the west coast were declared overfished by the National Marine Fisheries Service in 2002, and are currently under a rebuilding program. Some areas of the West Coast have experienced dramatic declines in yelloweye populations. In April of 2010, yelloweye in the Puget Sound/Georgia Basin were listed as a threatened under the Endangered Species Act. These declines in yelloweye populations were largely attributed to overfishing. Another contributing factor to the vulnerability of yelloweye is the lack of a vent on their swim bladder (a balloon-like organ used to adjust buoyancy). Without venting, yelloweye brought from up from depth can suffer injury as air in the swim bladder expands. This often leads to bulging eyes or the stomach protruding from the mouth, in addition to unseen internal injuries. With an inflated swim bladder, yelloweye cannot readily submerge, and if released are subject to predation while floating on the surface. Puncturing the stomach as it protrudes from the mouth gives the appearance of helping yelloweye by allowing them to submerge, but this practice is strongly discouraged as it usually results in delayed mortality. 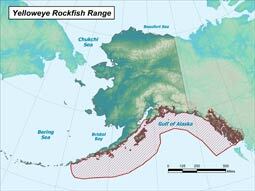 Because of the low survival rates of released yelloweye, catch and release fishing is strongly discouraged. Alaska Department of Fish and Game has been conducting research on the effectiveness of devices which allow rockfish to be released at depth. Preliminary results have shown promise for increased short term survival. However, further research is required in order to examine long term survival. Anglers are encouraged to avoid rockfish habitat when fishing for other species and to keep baited lures off of the ocean floor. In Prince William Sound and Southeast Alaska anglers must retain all non-pelagic rockfish caught until the bag limit is reached.